Learn to make Strawberry Lassi Recipe | Strawberry Yogurt Smoothie with an easy step-by-step video tutorial. Strawberry lassi is a presentable, cooling, and delightful beverage made from fresh strawberries, some yogurt, milk, sugar, and cardamom. Starting your day with this magical drink is enough to make all your problems go away in that particular moment. This lassi is also suitable for any of your festive menus. Lassi is an utterly delicious cooling yogurt drink originating from the state of Punjab, North of India. However, lassi is quite popular throughout the Indian subcontinent. A plain lassi refers to a simple yogurt-based refreshing, cool, and light drink which is well loved by all. Sweet lassis can also be considered as light desserts. 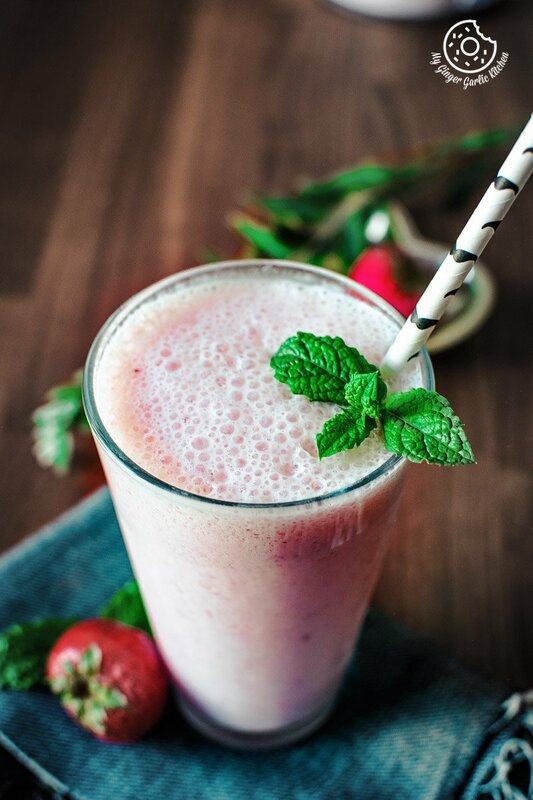 A simple strawberry lassi is mainly a yogurt-based strawberry milkshake or smoothie. Homemade strawberry lassi is indeed very bracing and super delicious. 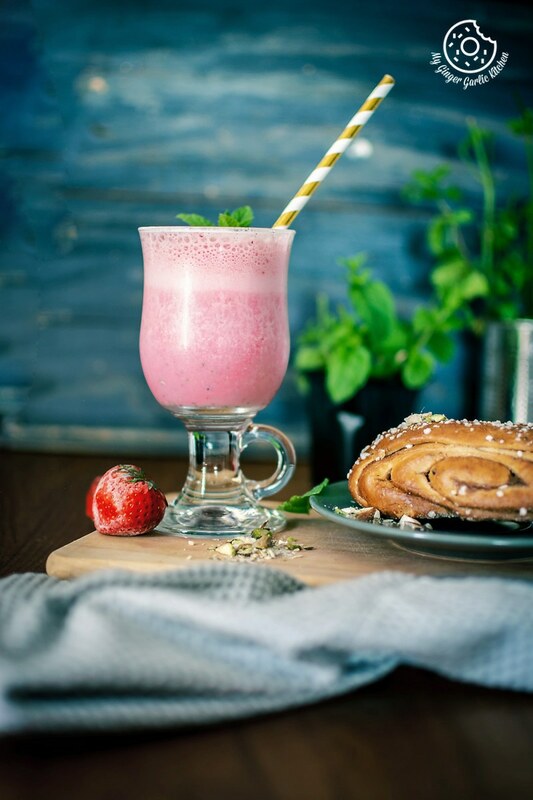 If you love strawberries and strawberry yogurt drinks, then you would definitely love to devour this strawberry lassi. Why drinking this strawberry lassi is most desirable during summers? In summer, all we want is to keep hydrated ourselves. Also most of the times, we don’t feel like eating something heavy. All we need is some kind of energy in terms of hydrating drinks. Isn’t it? That’s where this lassi comes in. Seasonal cooling dessert-like drinks are the best when it comes to reviving ourselves during hot days. What else could be greater than the use of seasonal produce for making summer cooling and energizing drinks? That’s why this strawberry lassi is perfect for relishing during summer. What time of the day is best to savor this strawberry lassi? You can have it as a breakfast, snack, or as an after meal drink. 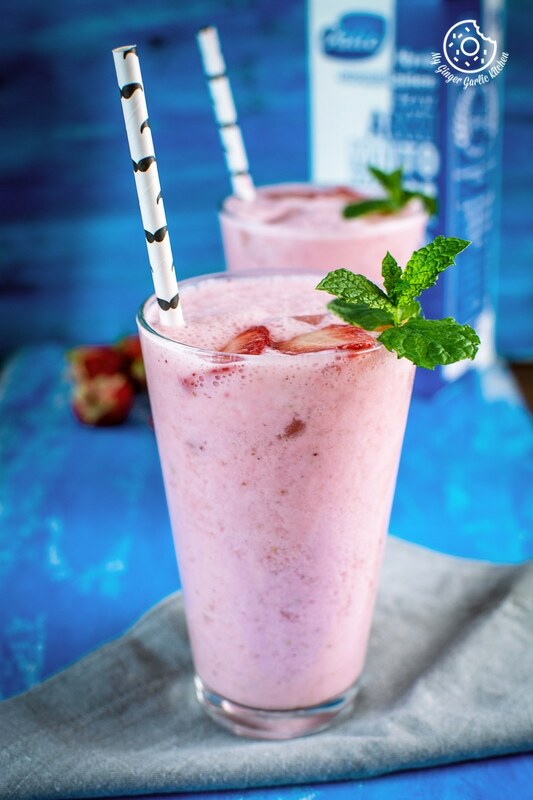 Well, I would say there is no particular time to cool off with a chilling strawberry lassi. Anytime is a good time. Is it hard to make strawberry lassi? I would say, making this lassi is very easy! The recipe I am sharing with you today is super simple and quick. It only needs little chopping and blending to get a fresh, delicious, and perfect looking lassi drink. What is the most popular lassi worldwide? If you ask about the most popular lassi served in Indian restaurants worldwide, then I would name ‘Mango Lassi’. I have been to many countries and went to many Indian restaurants there. What I saw is that ‘Mango Lassi’ was found almost everywhere. Mango lassi is considered to be a star drink everywhere I must say. What is the most favored lassi in India? In India, people love to drink all types of lassis. But on a regular basis, people adore drinking either sweet lassi or salty lassi. In sweet lassi sometimes cardamom flavoring is added and sometimes it is a mix of 3 ingredients only. These ingredients being yogurt, sugar, and ice. That’s it. Simple and delish. In salty lassi, people usually add salt and sometimes flavorings such as roasted cumin powder, dried mint powder or fresh mint leaves. No matter what type of lassi you are drinking, it’s always so refreshing, and thus feels so good. 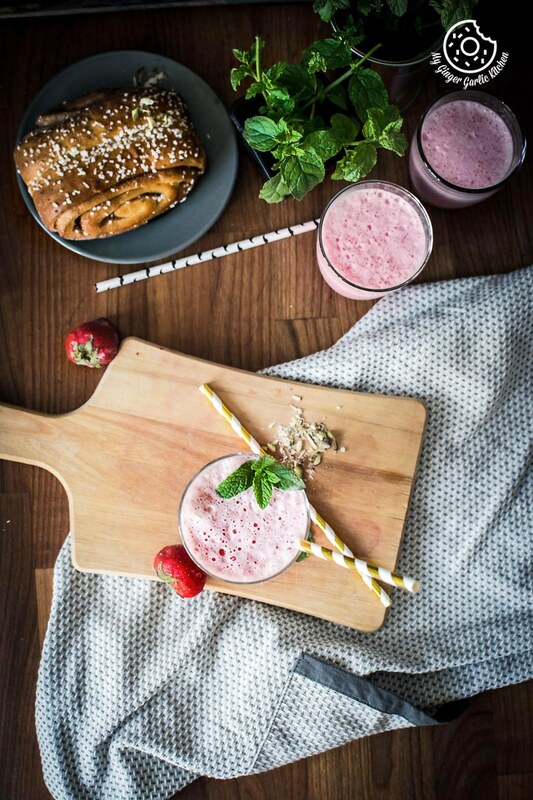 Is it necessary to use strawberry puree for making this strawberry lassi? No, it’s not. You can simply add raw strawberries to the blending jar along with other ingredients and blend it. Making puree first makes things a little faster and easier. 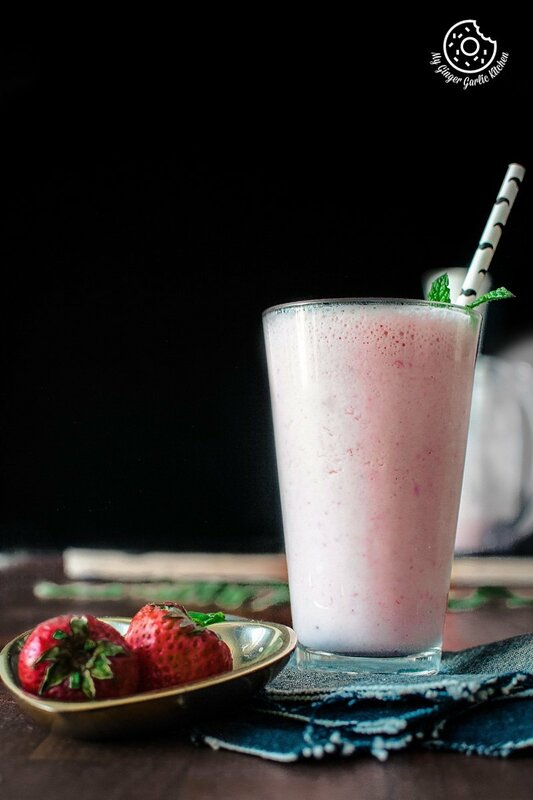 You can also use frozen strawberries for making this lassi. Cardamom and rosewater flavorings are added to the strawberry lassi. But is it compulsory to add them? Adding cardamom and rosewater seasoning is completely optional for this strawberry lassi recipe. But if you ask me, I would highly propose adding them both to your strawberry lassi because the combination of cardamom and rose water really notches up the lassi flavor. If you’re a fan of cardamom, then you should certainly use it. How to consume fresh strawberries? When the season is right, and the strawberries are in abundance at the farmers market, it’s a good idea to grab as much as you can. Freshly hand picked strawberries direct from the farms are so organic and precious and you don’t want to waste them. So my family eats as many strawberries as possible. And after eating plenty of strawberries, I try to make every possible dish with strawberries. And lastly, I freeze them for later use. What kind of yogurt is best for making strawberry lassi? You can use any kind of plain yogurt. Use Greek-style or Turkish-style yogurt if you want lassi really rich and creamy. If you want your lassi not too thick, then use regular yogurt. How to serve Strawberry Lassi? Serve your strawberry lassi immediately after blending. Fill glasses with ice cubes or crushed ice. This is optional. 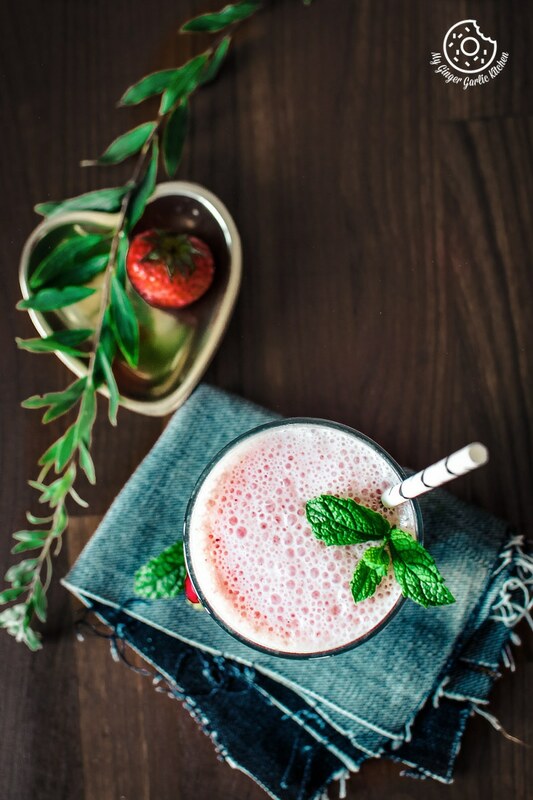 Pour lassi slowly into a tall glass, garnished with sliced strawberries or mint leaves. Can you replace sugar with honey or maple syrup for making Strawberry Lassi? Yes, definitely. Adding sugar is not necessary for strawberry lassi. It depends on the variety of strawberries you are using for making your lassi. You can easily swap sugar with honey or maple syrup. You can also use brown sugar or cane sugar for making strawberry lassi. If your strawberries are sweet enough, then you can omit the sweetener completely, or you can reduce the amount of sweetener. Is milk necessary for strawberry lassi? It’s not. However, I always prefer to add some milk with yogurt for making strawberry lassi. It balances the flavors. But if you don’t want to add milk then you can replace the milk with the same amount of yogurt. If you liked this strawberry lassi, then I guarantee that you will also like this spicy salty strawberry lassi aka strawberry masala chaas. 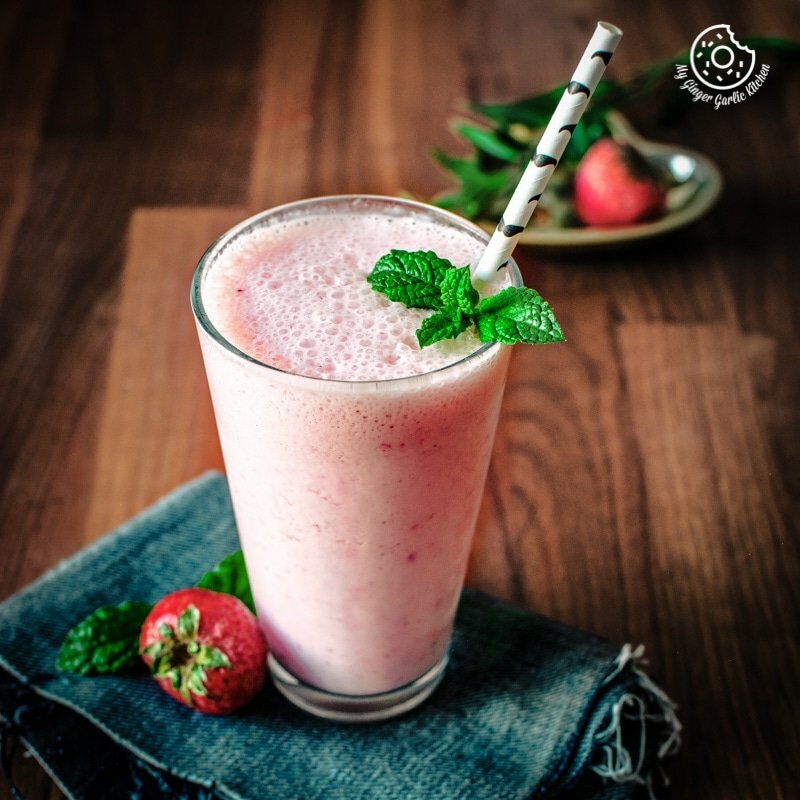 Strawberry lassi is a presentable, cooling, and delightful beverage made from fresh strawberries, some yogurt, milk, sugar, and cardamom. Starting your day with this magical drink is enough to make all your problems go away in that particular moment. 1. Put chopped strawberries into a blender and blend for 1 minute to make a puree. 2. Now add yogurt, milk, sugar, and cardamom into a blender and blend for 1 minute. 3. Lastly, add rosewater and blend for few seconds. 4. 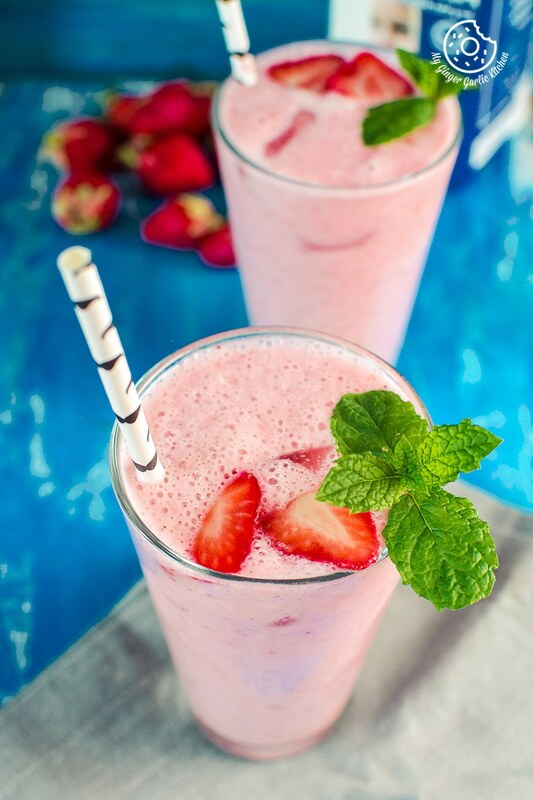 To serve, place few ice cubes in each of 2 tall or 4 small glasses and pour in the freshly made strawberry lassi. 5. Top with the sliced strawberry and mint leaves. 6. Serve immediately or keep it in the refrigerator for 30 minutes.